I'm not typically one who follows political issues, such as movements for independence in tiny regions of the world. It's difficult enough for me to muster up interest about politics in my own country, let along other countries. But whenever I travel overseas, I'm fascinated to learn about how political matters shape society. When I traveled to Turkey a few years back, I was enthralled by how current President Erdogan was reversing nearly one-hundred years of progress made by the much revered Mustafa Kemal Atatürk. Now that I'm traveling to Spain, I find myself equally enthralled in the Catalonian independence movement. For starters, Catalonia is an autonomous region in the northeast corner of Spain. Barcelona is the largest city in the region as well as the region's capital. 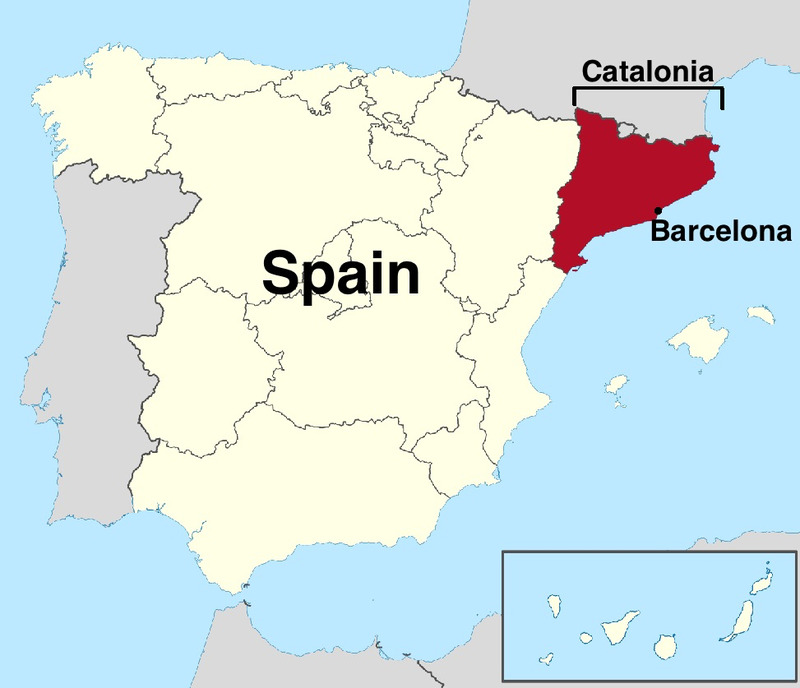 The Catalonian region of Spain, with its largest city being Barcelona. I knew Catalonia was an independent-minded region, but I wasn't familiar with the history or extent of its autonomy. Catalonia has a long, long history. In the interest of keeping things somewhat current, I'll share that, starting in 1939, Catalan nationalism had been banned under the fascist regime of Francisco Franco. (As a refresher from your high school European history class, fascism is a governmental system led by a dictator who has complete power and who forcibly suppresses opposition and criticism.) With Franco's death in 1975, Catalonia regained its right to be Catalonia. Today the region enjoys limited autonomy in matters such as education, healthcare, and security. What I didn't realize was that the movement towards independence has been particularly strong in the last few years. There are a lot of elements at play in Catalonia's current political drama. I'll do my best to relay the Cliff Notes version of the situation, giving you only the relevant facts and explaining them as simply as possible....because...well...this is how I prefer things to be explained to my tiny brain. President Puigdemont is the the dude in charge of the Catalonian region. In the eyes of the separatists, President Puigdemont is the protagonist. Prime Minister Rajoy is the head honcho in charge of all of Spain. In the eyes of the separatists, Prime Minister Rajoy is the antagonist. In June of this year, President Puigdemont announced that there would be a referendum, which would allow the region's citizens to vote for or against Catalonia's independence from Spain. (You may recall from your freshman year political science class that a referendum is when a matter of pubic importance is voted upon directly by the people.) The referendum would be held on October 1st, four days before I would arrive in Barcelona. Grafitti I saw on a wall near Park Güell. When Prime Minister Rajoy got whiff of the referendum, he said, "Nope, you can't do that, you stupid Catalonians. Holding a referendum of this nature is illegal. It's against the Spanish Constitution." But the strong-headed Catalonians ignored Rajoy and proceeded with their plan. Upon this blatant disobedience, Rajoy ordered the seizure of voting boxes, ballots, and pro-independence marketing material. But the Catalonians weren't deterred, because voting boxes could easily be replaced and ballots could easily be reprinted. Then, eleven days prior to the referendum, Rajoy detained Catalonian officials responsible for the voting. Unsurprisingly, the pro-independence Catalonians protested. When October 1st finally rolled around, the polling stations in Catalonia opened their doors, and Catalonians began to cast their votes. Lo and behold, the Spanish National Police, under the orders of Prime Minister Rajoy, raided the polling stations. The police clashed with voters and pro-referendum supporters, dragging Catalonians away from the polling stations by their hair, beating back voters with batons, and seizing voting boxes and ballots. The police even fired rubber bullets at the crowds -- lots of rubber bullets. By the end of the day, more than 800 people had been injured. The Catalonians felt as though their right to vote had been forcibly oppressed. Flashbacks of fascist Franco danced like moldy sugarplums in their heads. An image I saw on a social media site compared a photograph of police beating citizens with batons under Franco's regime with a photograph of police beating citizens on referendum day. The only difference, really, was that the first photo was in black'n'white, and the second photo was in color. And, boy, blood sure does look a lot more bloody in full technicolor! In response to the police brutality, more protests were held in the days after the referendum. Many Catalonians claimed that the Spanish government had violated their human right to vote. Stickers I've seen all over Barcelona. 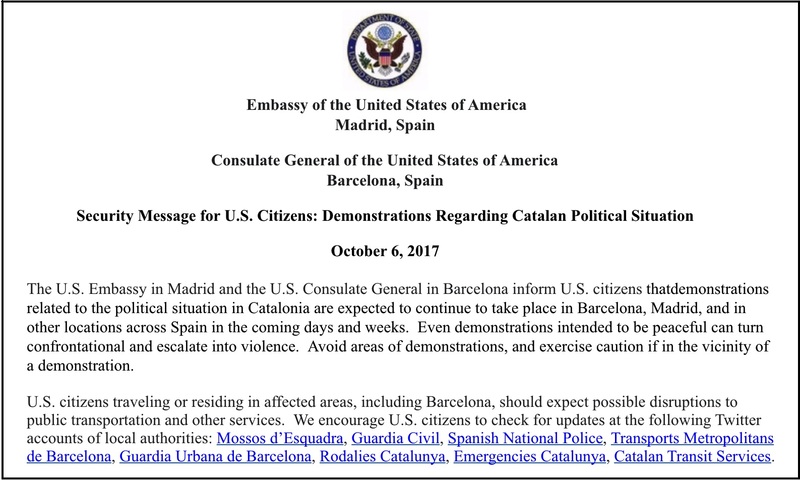 Some of the polling stations, however, were able to proceed on October 1; they were not disrupted by the Spanish National Police. The votes were counted -- 90% of the votes were in favor of independence. Given this seemingly overwhelming voice for independence, President Puigdemont stated that Catalonia deserved to be independent. There is, however, some inherent fault with the voting. Only 42% of the population's votes (around 2.25 million Catalonians) were counted. Who knows how many votes were captured by the Spanish National Police and whether those captured votes were for or against independence. Plus, there is reason to believe that some individuals submitted multiple votes. Regardless, President Puigdemont ran with the seemingly overwhelming votes in favor of independence. He said he would unilaterally declare independence at a meeting of the Catalonian parliament. In theory, that would be all fine'n'dandy, but the Spanish Constitutional Court declared that the parliament session would be unconstitutional if independence were to be proclaimed. In anticipation of President Puigdemont's declaration of independence, the Spanish government cancelled the Catalonian parliament session. As of the publishing of this post, President Puigdemont has yet to officially declare independence. Before the referendum, the people of Catalonia simply wanted to have their opinions be heard via a vote; they were not interested in using violence to bring about independence. In light of the police brutality and the Prime Minister's declaration that the Catalonian have committed unconstitutional acts, it's safe to say that the separatists are feeling a bit stymied. Daily rallies continue in Barcelona in favor of independence. But rallies are being held, as well, by those who are against Catalonian independence. These folks fear that a horrendous economic and social backlash would result if the region were to separate from Spain. Clearly the citizens of Catalonia are polarized. At this point in time, everyone who has their heads screwed on straight is urging for peaceful, adult dialog. Catalonia is willing to have such a conversation; Spain is not. Spain has said it won't talk with Catalonia until President Puigdemont withdraws his plan to declare independence. Spain has said that Catalonia first has to obey the law before it will enter into a dialog. As of now, President Puigdemont is standing firm in his plans to declare independence. Should President Puigdemont make his official declaration, it is possible that Prime Minister Rajoy might call Spanish Constitutional Provision Section 155 into play. Provision 155 enables Spain to suspend independent rule in a home region. Perhaps President Puigdemont would get thrown in the slammer and Catalonia would end up losing its autonomy. One step forward, ten thousand steps backwards. Regardless of what happens, Spain and Catalonia are in the midst of a constitutional crisis. It's unlikely that violence would be used. But the Spanish National Police has demonstrated that they are willing to use force. The separatist Catalonians are feeling quite betrayed at the moment. When emotions are impassioned, you never know what can happen. People do desperate things in desperate times. In light of the political situation, I enrolled in the Smart Traveller Enrollment Program (STEP). Run by the Bureau of Consular Affairs, STEP is a free service allowing US citizens and nationals traveling and living abroad to enroll their trip with the nearest US Embassy or Consulate. The most immediate benefit of enrollment is receiving email notifications about safety conditions in the destination country. Other benefits include providing the US Embassy with contact information should an emergency arise. I received an email from STEP two days before I left for my trip. The email notified me of wide-spread strikes. 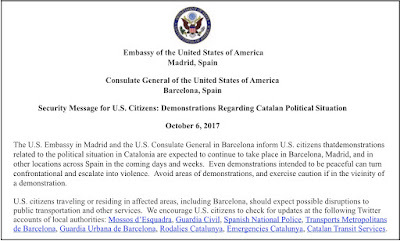 Yesterday, I received another email advising travelers to be cautious of continuing political demonstrations in the coming days and weeks. An October 6th security message from STEP. There are Catalan flags hanging everywhere in Barcelona. in the Vila de Gràcia neighborhood. For a brief while before I left for Barcelona, I debated whether I should proceed with my travel plans. In the end, I decided to stick with my original plans. Regardless of how the political situation unfolds, this is an exciting time in Spain's history (though "trying" is probably a more apt adjective). Who knows? I flew into El Prat airport at the beginning of my trip. The airport is located in Barcelona, Spain. Perhaps when I fly out of El Prat at the end of my trip in three weeks, I'll be flying out of the new country of Catalonia! As for my two cents on Catalonian Independence: I'm all for establishing and following rules, I'm all for allowing people to express themselves and have a voice, and I'm all for maximizing unity. I think it's time for Spain and Catalonia to sit down, brew a fuckload of coffee, cry some tears, specify their wants and their needs (yes, there is a difference between the two), and then come to an amicable solution. Come on, let's be adult about this. May the political forecast call for sunny skies! I heard about all this right after reading you were going. I almost jumped on the email to holler BE CAREFUL! But then thought, "it's Sarah! She's got this!" Thanks for the tutorial, I now understand much better, and BRAVO for continuing the trip! Keep us posted, and if you need anything shout! Wow! Excellent commentary, and it explains so much better than the 30-second shorts on the 10 o'clock news. Thanks,and enjoy your time in the area.